...As I Remember It...: FINISHER!!! Folks, I did it!! 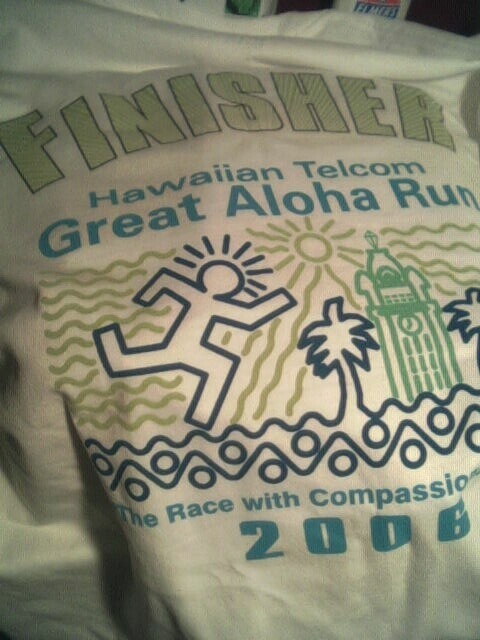 I am a finisher of the Great Aloha Run, here in Hawaii. 8 Miles! I will definitely blog about it later. Let's just say -- I feel like I can do ANYTHING. I am so happy for you. Congratulations and get a good rubdown and some rest. I'll be back to read all about it because I know it was a hum-dinger. Oh, old hat. You CAN do anything. My hat is off to you!! *can't you see my bowing*! Congrats! My body shuts down after 6 miles, so you are to be commended. You's a BAAAAD woman!